Two artist friends, two terriers and an empty shop. When The Blue Easel Gallery opened in 2017 the then joint owners of the gallery, Ruth Farquhar and Jennifer Thomson had know each other for a long time. They met in 1999 at the Cramond Mother and Toddler Group at Cramond Kirk Hall, both were there with their baby sons who are now 20. They shared a passion for art and a passion for their local surroundings. They immediately hit it off and became friends. Nowadays Jennifer has two children and a mischievous fox terrier and Ruth has three children and a mischievous Irish terrier! Their first joint artistic venture was when they were asked to design and paint a huge mural on the outside of their children's school, Cramond Primary. They had great fun and inspired many pupils, parents and teachers to leave their own mark too. The end result depicting a colourful scene of Cramond was called "Keep Cramond Beautiful". When an empty shop became available in Cramond Village they jumped at the opportunity to have a space in which to exhibit their work and share their ideas. A few of months of hard work followed, in order to turn the dark disused shop into a light-filled gallery. 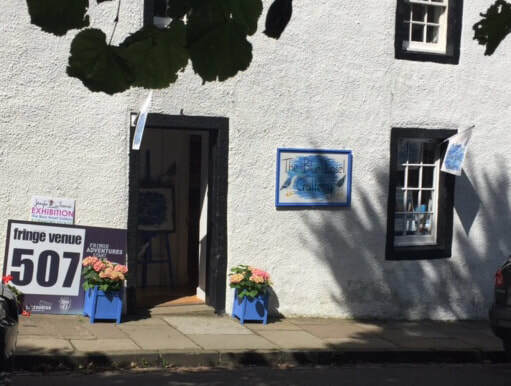 On March 31st 2017 The Blue Easel Gallery opened its bright blue door, welcoming everyone in to enjoy their artwork - colourful, up-lifting scenes of Cramond and beyond. For the first two years Ruth and Jennifer had their own original paintings on display in the gallery as well as prints, cards and a range of gifts such as coasters, table mats, tea towels, cushions, mugs, jigsaws, fridge magnets and posters. Ruth's work is mainly inspired by Cramond itself - the village, the harbour, the island and the flora and fauna that are found there. Jennifer paints Cramond too, but is also inspired by the city life of Edinburgh and the beautiful beaches and harbours of The East Neuk of Fife. Both artists thoroughly enjoyed their new artistic venture, having the opportunity to share their work locally and to meet so many interesting visitors to the gallery. At the beginning of this year Jennifer made the difficult decision to step away from the running of the gallery to spend more time with her family. We were sad to see her go however we will continue to stock a limited range of her prints, cards and gifts. Ruth is looking forward to exciting times ahead, with her own art and the gallery.